Looking good! Glad to see that you found a way to use the pieces of insulation you had cut off. Thanks. Since my test of the foam glued together, where the foam broke away instead of at the seam, I suppose I could "glue" some smaller pieces together if I wanted to. I'll have to see how much I need to finish the curved portions, as opposed to how much I have available. Went to the motor home today, and started removing the braces that were holding the curved pieces of insulation in place. After removing them, I took a couple of pics. Man, those curves look good! 36-24-36. Ok, not THOSE curves. Lol. 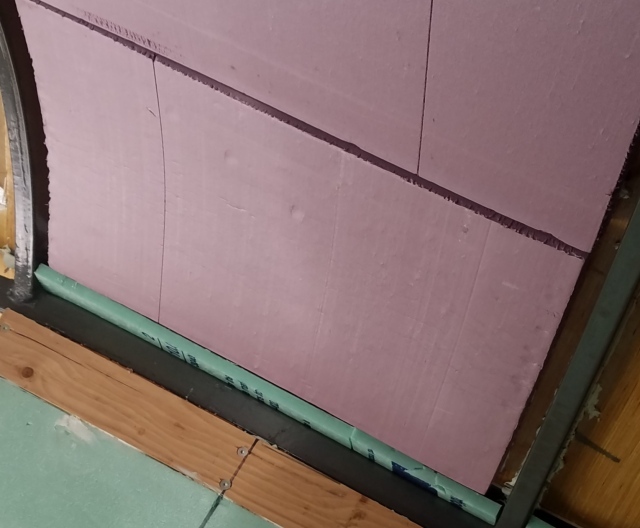 The insulation is adhered to the roof plywood, and isn't going anywhere. Yay! With that in mind, I cut more insulation to fit the rest of the curved areas on the passenger side. One at a time, slapped on some M-1 adhesive and proceeded to prop up the new pieces. Here's a shot towards the front. Here's a shot towards the rear. And a slightly wider shot to the rear. That means all 10 of the curved pieces on the right side are now in place. I'll let them sit there for 2 days before removing the braces, then I can move on to the drivers side. Yee Haw! Are you spray foaming the cracks while you wait for the M-1 to cure or doing it after the bracing is removed? 1995 Gulf Stream Scenic Cruiser 34' Diesel Pusher Cummins B5.9 12 Valve Engine, Allison MD-3060 6 Speed Transmission. I am waiting until I have the foam board in and mostly cured before I spray the cracks. There is a small area above the wall framing that will also need to be spray foamed as well. In some of the pics, you can see the green foam board I have stuck in there along the edges, just to keep the air from blowing through there. 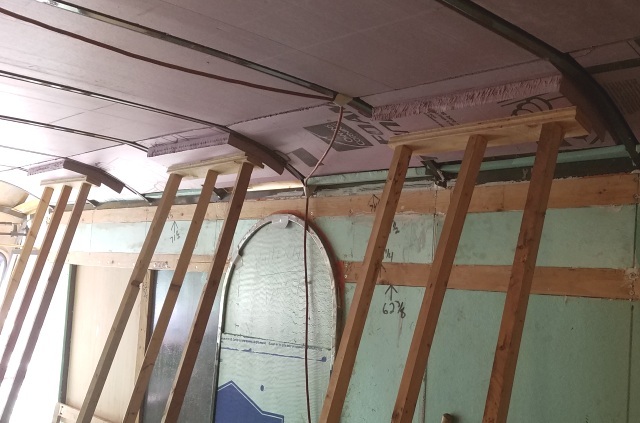 I also will cover the steel framing at the top with insulation, as that is an area for much heat loss, even in a house, so I want that covered up as well. 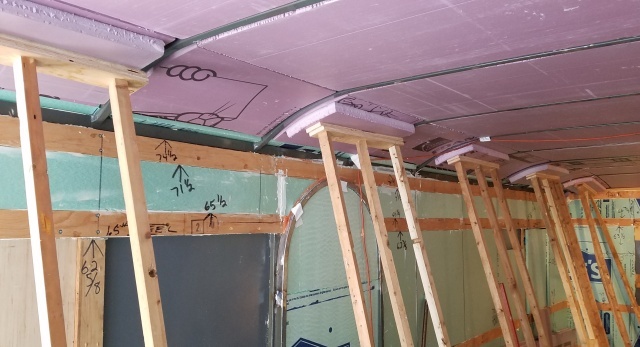 If you look at some of the good 4 season rv's, they will cover the wall/ceiling joint with insulation, and then cover that with a 45 degree "trim" to help eliminate heat and cold transfer. They will also do that at the ends of the rv with the wall to wall connection. Tomorrow I plan on starting on the drivers side. I am glad I was able to get the foam board to bend for the edges. Anytime you build anything that isn't square, rectangular, and flat, it always presents some situations that are a little more difficult to deal with, and creates extra waste. I knew that going in, so it didn't come as a surprise. Here is a little drawing showing how I intend to finish off the corners between the wall and ceiling/roof. 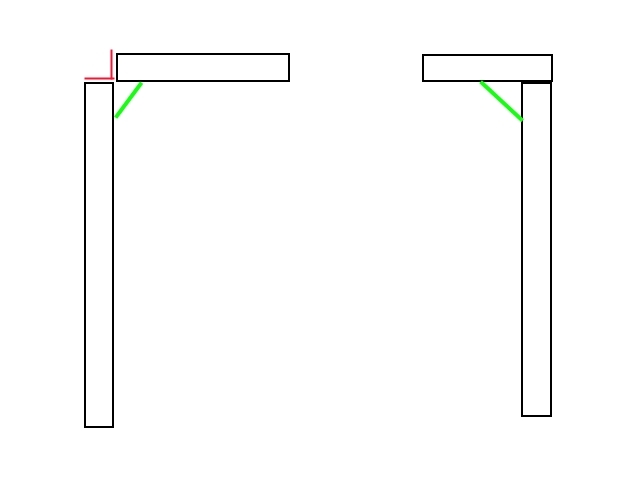 The left and right sides are attached differently, indicating the 2 more common ways of attaching the roof to the top of the wall. 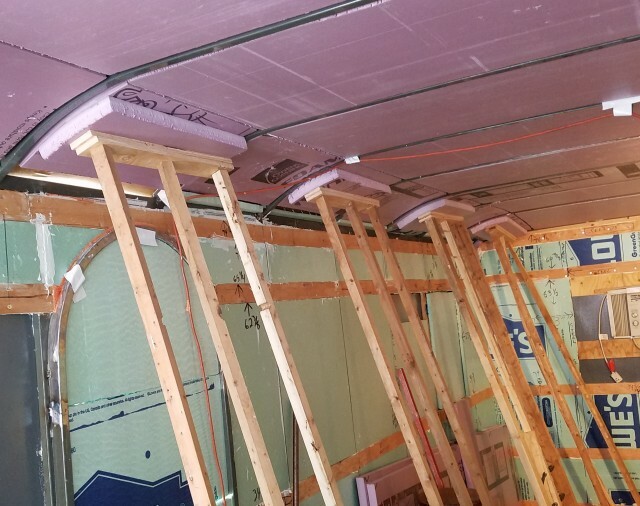 The green line will have insulation behind it to help slow the heat and cold transfer through that area. Long winded answer for a simple question. Lol. That insulation job is looking pretty tight. Too bad you could not have done an energy audit before and after to see how much better the insulation is now. None of the manufacturers are going to take the care that you have taken with your installation. Got a rather pleasant surprise over the weekend. We had a window that was leaking water because the rubber seal had shrunk and pulled away from the frame (not the pleasant part) so I found a place to order the rubber seals and decided to replace all the seals on all the windows. Did that over the weekend. Had never thought that the windows were drafty, but after the seals were replaced was pleasantly surprised. If you are reusing the same windows, you might want to think about replacing the seals between the glass and the frames before you install them. The proof of the pudding is in the eating, as the old saying goes. When it got cold out - the walls would just radiate cold off of them into the coach. You really didn't want to get up against one of them in the middle of the night with no shirt on! The biggest difference now, is with the lack of the cold radiating into the coach, because of the double insulation on the walls. The ceiling will be the same. 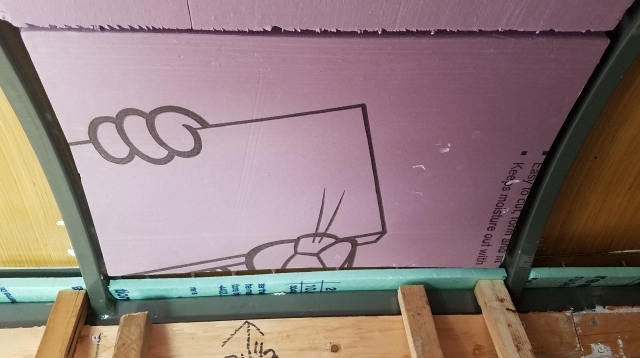 If I put my hand close to the insulation, there is no major cold radiation coming from there. I figured number one was to try to cut as much air infiltration through the walls and roof as possible. That means filling every gap, crack, and hole with some type of spray of rigid foam insulation. Second, is to try to cut heat and cold radiating through the walls, roof, and windows. It's unfortunate that windows used in rv's are aluminum framed. Aluminum will transfer heat and cold very effectively. Think about a steel door. Without a way to separate the inner and outer skins of a steel door, that provides a wonderful way to act like a heat sink. Ideally would be to use a material for the window frames that doesn't do a good job of transferring heat and cold. Glass is another one that insulates poorly. Lexan, will not transfer nearly the same amount of heat and cold through it, that glass will. Also unfortunate, in our state, vehicles are required to have a form of safety glass on the side windows. Tempered glass qualifies. If you have ever used a piece of lexan in place of glass, you know what I mean. Perhaps I can add a second removable piece of Lexan on the inside that's removable to cut down heat loss through the windows. That's why there are thin plastic sheeting sold to provide a second cover over windows to reduce heat loss, for houses. The very thin layer of plastic makes a huge difference in the heat transfer. It's amazing how a few cracks here and there provide such a wonderful way to leak an amazing amount of air. I do plan on using the window, (glass), but not the frames. Too much cold and heat come through the frame to suit me. I'll have to see how that shakes out. Lol.